In recognition of his achievements in football, Manchester United boss, Jose Mourinho has been honoured in his hometown of Setubal. 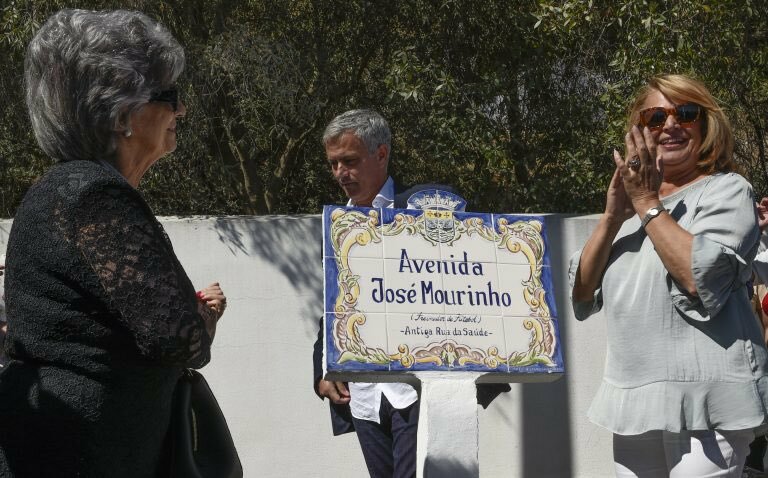 Local authority in Portugal renamed the former Rua da Saude road on the seafront as ‘Avenida Jose Mourinho‘. The Portuguese and his mother, Maria Julia Santos and Setubal mayor Maria das Dores Meira, attended a ceremony on Tuesday for the grand unveiling. Speaking on the honour, the 54 year-old said. “If you ask me, if I’m grateful, excited and proud, yes of course I am. I say yes to everything,” he told reporters. His mother described him as a ‘son of Setubal, a man of the world, a global personality’ and ‘one of those Setubalenses who fill us with pride because he is really special, has a special talent, has special love for their land’.